Looking to study a Master’s in internal audit management degree in Birmingham? Our MSc Internal Audit and Consultancy Management course boasts a Route to Chartered Status from the IIA UK. The internal audit profession formally began when the Institute of Internal Audit Inc. (IIA Inc.) was formed in the early parts of the 20th Century. Since that time the profession has developed extensively keeping pace with the demands placed on it by Board and Audit Committees in an ever changing and challenging world. With the drive across the globe for integrated reporting to increase transparency, increased regulation such as the introduction of the Sarbanes Oxley Act in the US, and the general publics’ access to real time information, boards and their audit committees are ever more in need of independent and objective assurance and internal audit has a vital role to play in providing this. To equip those working within or intending to join the internal audit profession with the conceptual understanding, knowledge and skills to contribute positively to the organisations that they work for. The learning and teaching methods are designed to encourage and support independent learning. Wherever possible real life case studies will be used to illustrate the learning. Face-to-face delivery (full time and part time block release students) will be delivered in an intensive week at the very start of study and where possible the cohorts will be together. This approach will help the different cohorts of students to meet and network, thereby creating greater opportunities for peer support. The week will predomionantly be in the form of workshops of group activities allowing students to explore and apply the understanding they have gained from prior reading provided on Moodle and be given formative feedback by the lecture team which can be used to help with the assessment. Where the assessment is an exam, 2 intensive days will also be provided which is timeed to best support completion of the exam. During these session the areas of the syllabus which students have found challenging will be covered as well as practicing exam quesitons both in groups and individually. Distance learning students will have access to all the materials through Moodle. During the intensive week the output from group activities will also be added to Moodle, allowing distance learning students to compare their own output with those of the group. All students also have access to the on-line disucssion forum where they can interact with each other and with the tutors on a group basis, and individual and group tutorials are also available by appointment. We are an established team with over 20 years’ experience of delivering courses accredited by the Chartered Institute of Internal Auditors (IIA) and the Internal Auditing Educations Partnerships (IAEP). Find out more about the programme here. The Centre prides itself on its extremely high pass rates. The lecture team is supported by guest speakers, who regularly visit to provide valuable practitioner insight. We get to know our students as individuals and support their specific needs, or signpost them to other areas of the University that can provide additional, complimentary support. The delivery is flexible so you can choose full-time or part-time with block release and distance learning as options. This means you can fit your studies alongside work and personal commitments. Join us for lunch to find out more about our postgraduate Accounting and Management degrees, and how you can continue your studies to take you to the next level. Didn't make it to an Open Day? You still have the opportunity to come and see what our postgraduate courses have to offer. If you would like to enquire about campus tour availability, just drop us an email. OR Certified Internal Auditor (CIA) global base qualification / Relevant professional qualification from the PIIA. In recognition that many students may already have a relevant professional qualification, Accreditation of Prior Experiential Learning (APEL) for individual modules and / or stages may be given on a case by case basis. Honours DegreeHonours degree or equivalent. While there are no additional costs associated with purchasing text books, there may be other costs to you. If you are joining the course which has a professional body accreditation you may be required to pay membership or examination costs. For details of these costs, please click on the link below. This module considers the purpose of internal audit and how it fits alongside other governance activities of an organisation. It explores the principles which sit behind the activity as well as how to ensure that a high quality function is delivered. It also looks at internal audit’s role in evaluating the anti-fraud framework in the organisation. This module is designed to guide the student through the management and performance of a risk based internal audit engagement which complies with the definition of internal auditing and the standards defined in the International Professional Practices Framework (IPPF) which were introduced in Essentials of Internal Auditing. The module will expose students to different areas of an organisation that they may be required to audit, helping them to understand best practice, risks and controls for the related processes. The module will focus on business acumen, information security, informational technology and financial management. This module seeks to explore the role, responsibilities and competencies of a head of internal audit. It will consider the development of strategic and operational plans for internal audit, the creation and leading of an internal audit function and being a consultant and advisor to the organisation’s leaders. This module explores how organisations operate and in particular the internal governance, risk management, assurance provision, strategic management and financial management of organisations. Again internal audit functions need to be designed and work to support these as well as to be able to assess them as part of their work (either as an audit engagement or as a consultant). 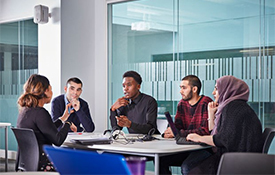 This module explores ethics, corporate social responsibility and sustainability which are all considered to be essential for organisations to succeed. Understanding this will help leaders to develop internal audit functions which take the organisations challenges and culture into account. In addition, internal auditors are often asked to provide advice on key challenges including these areas. In this module students will critically assess risk management and propose innovative and creative developments that will improve the practice of risk management and bring further value to organisations. Students will also look at how risk management can be a catalyst for improvement and innovation within an organisation and how change can be managed through to efficient and effective implementation. Finally they will look at their own personal development within the profession. As this is a research project of the students choice in the area of internal audit, any of the Programme learning outcomes can apply depending on the area that the student has chosen. It will be the responsibility of the student / apprentice and their allocated mentor to identify which Programme learning outcomes relate to the research project. Our course is available to study in a range of options, ensuring you don’t have to miss out. This course is also offered as a distance learning option, enabling you to study at a time that suits you. You don’t have to attend any face-to-face sessions, and delivery of course materials is done through our e-learning platform, Moodle. Each module with an exam has a revision day which, although not mandatory, you should highly consider attending. If you can’t make it, supporting materials are made available via Moodle. If you’re an international student, you can sit your examinations at your British council offices for a fee payable locally of around £100 per examination. This option sees you attend intense face-to-face teaching on campus from Monday to Friday for each module, one a term for years one and two. In year three the block weeks take place in the first term for both modules in order to support early initiation of your research project. This option also provides the flexibility to incorporate some distance learning, to accommodate your work and personal commitments. You can do this at no extra charge and with no penalties. Professional Innovation and Development which is a presentation (which can be done remotely over Skype, for example) and reflective diary. Joining BCU back in 2014 whilst still working full time, Mariusz had the help of his tutors to successfully balance his work and his studies. He is now a Senior Internal Auditor for the Royal Bank of Scotland. Staff at Birmingham City University have a wealth of skills and experience within the audit world. Their teaching methods demonstrate how theory is actually applied in practice. Each class taught me new skills which I was able to apply in my internal audit role immediately. Studying part-time for his Masters, and with a career that embraces lecturing and consultancy, Simon appreciated both the academic and professional relevance of his course. I chose Birmingham City University because the course reflected my professional aims, and helped me in my consultancy work as an Internal Auditor. Graduates can progress to complete a PhD in a related area of internal audit, governance or risk management. Originally from Bessbrook in Northern Ireland, Dr Rodney Irwin studied at the then University of Central England. He has enjoyed a global career at the World Business Council for Sustainable Development (WBCSD) and has also gone on to gain further qualifications including a PhD. In October 2012 I took a role as Managing Director of Financial Capital at WBCSD - a membership organisation made up of 190 global businesses. I engage with businesses and support them with reporting in non-financial performance, strategy and innovations on corporate reporting. I also sit on the International Integrated Reporting Council (IIRC) working group, am a member of the Advisory Board of the Sustainability Accounting Standards Board and a Board Member of the Climate Disclosure Standards Board. There are planned field trips each term to local organisations. These trips will be accompanied by a seminar from a visiting professor on a related topic. We also have a guest speaker programme, bringing the working world into the University. These talks are delivered in the block weeks, and presentations are posted on Moodle so that they are available to everyone. All assignments are grounded in the real working organisations, allowing students to apply their knowledge into a real working environment. Skills assessment takes place at the start of each term and students are encouraged to create a development plan to enhance their skills and work experience over the duration of the course. Lecturers will support students in finding opportunities to support this wherever possible. Many of our students are already employed and are sponsored through their study. Typical organisations that they come from include local authorities, health sector, central government and government agencies, financial services, charity organisations such as the Big Lottery and professional service firms such as Deloitte, PWC, Grant Thornton and BDO. Many of our students work in internal audit or a similar role such as compliance or financial control. Some are deliberately sponsored by their employer for this course so that on their return they can set up an internal audit function or apply the concepts to their existing department. Andy Hollyhead joined the University in 2003 after 15 years in industry in a number of large organisations, including roles as business systems analyst and project manager. He is part of the Centre for Internal Audit, Governance and Risk Management. Ann began her career in insurance, underwriting and processing claims, for a large national building society. She then moved to working in a global treasury department, verifying and performing transactions all over the globe. Alan Robson graduated in 1985 with one of the first Information Systems degrees in the country, before moving directly into lecturing. He joined Birmingham City University in 1986 as a lecturer in computer programming and systems analysis, and in April 2009 he joined the Centre for Internal Audit, Governance and Risk Management. Balvinder Plaha joined Birmingham City University in 2015 and currently teaches the finance and corporate governance modules on the MSc Internal Audit, Governance and Risk Management and risk response and risk leadership on the MSc Risk Management course.